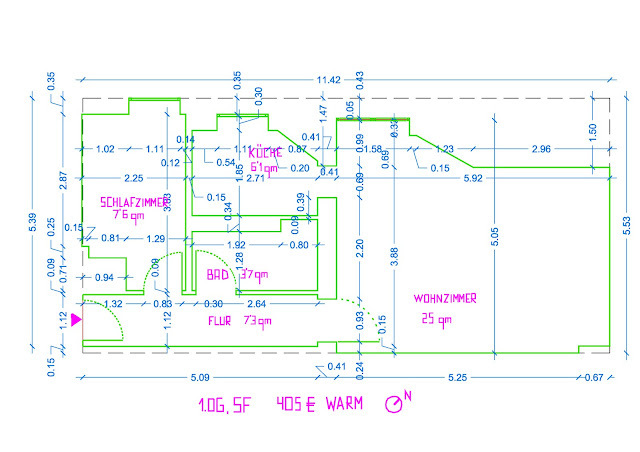 We measure my apartment in Kreuzberg and draw it exactly, 1:1 scale, with tape on the sidewalk. Rooms with doors, windows and furniture. We spend time inside (outside). We walk along the corridor, sit on the couch, dance in the dining room, lay in bed. Do we act differently when everyone can see us? How does the size feel when there’s no walls, when the ceiling is the sky? How much love can you put in a piece of street? With this reference to domestic life, the street takes a presence which we are not used to, it becomes visible and we are faced with our own reaction: surprise, recognition, wonder. The project Wie Zuhause overlaps private to public space, questioning its limits, comparing their intensities of use, and the perception of its dimensions. I am in my bedroom around 240h per month. In the dining room 210h and in the kitchen, about 45h. 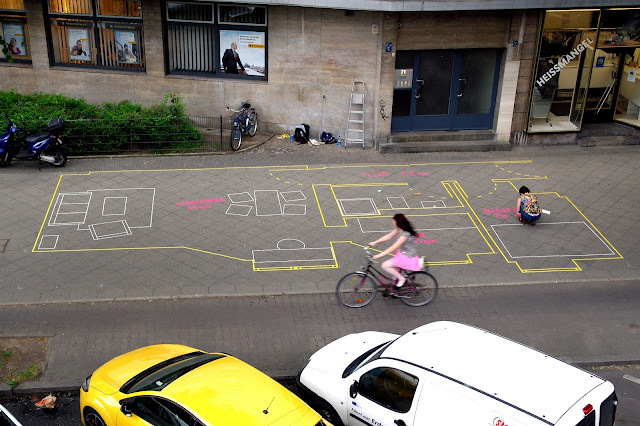 We wonder how it would be like to spend so many hours in the same amount of space as at your place, but on the street. Which meanings would the spaces get, which stories. But while home has greater intensity of use, our everyday personal life makes it imperceptible. We are amazed, however, with the unusual things that we meet in the streets. There are two ways to behave and use the built environment. In the space of housing, we accumulate furniture and objects that collect and evoke our memories. In the public space, generously sized and emptied, every day starts from scratch. “Wie Zuhause” took place the 20th May 2011 in Skalitzerstraße, Berlin. It lasted 5 hours. Afterwards it was dismantled, we do not know whether by residents or the city cleaning. The only thing left, and stayed several months, were the pink letters “QM”, square meter.